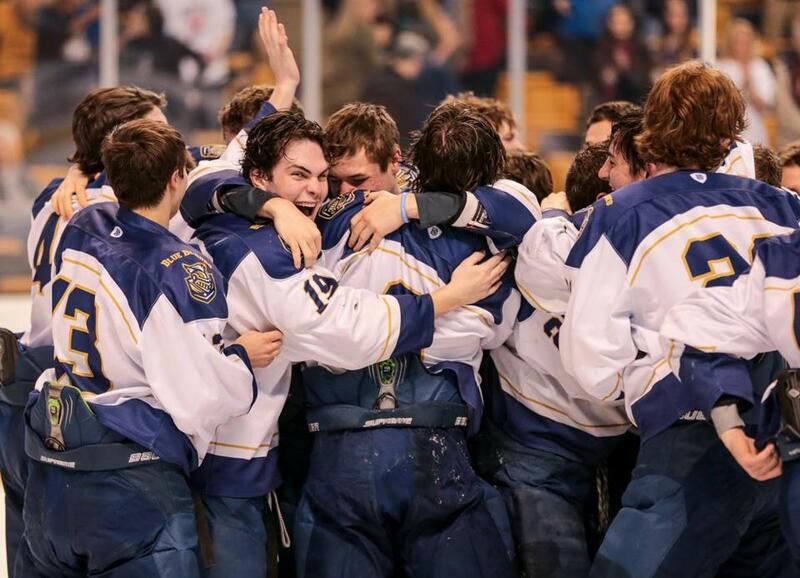 Malden Catholic players celebrated after winning the Super 8 title. Carpenter had the scorer’s touch as Austin Prep logged back-to-back Super 8 appearances. The Catholic Central co-MVP scored a team-high 39 points and led the CCL with 26 goals. At 7-0-3, the Cougars went unbeaten in league play for the second straight season. Centering the highest-scoring line in the state, Crinella helped the Panthers reached their sixth consecutive Super 8 tournament and earn their first postseason victory since 2010. He led Division 1 with 61 points (31 goals, 30 assists). It was another banner year for Nazarian, a three-time Catholic Conference All-Star and three-time Super 8 champion. The junior from Boxford finished second in Division 1 with 57 points (22 goals, 35 assists). A dual-threat defenseman for the top seed in the Super 8 tournament, Shea helped anchor the stingiest defense in Division 1 (34 goals allowed) while aiding the Eagles’ offense with a team-high 23 assists. He’s also a Catholic Conference All-Star. With the Division 2 title in hand, Irving skated off TD Garden ice as perhaps the greatest player in Panther history. A 24-goal, 31-assist senior campaign catapulted Irving’s career numbers to 74-122--196, cementing his legacy as Beverly’s all-time leading scorer. Following a year at Brewster Academy, MacBurnie returned for his senior season and backstopped the Spartans to the Division 1 North semifinals behind a 1.64 goals-against average and seven shutouts. For his efforts he was named the Catholic Central Large MVP. Wilmington’s first season in Division 1 ended with a trip to the North Sectional final. A two-time Division 2 champion and Middlesex Freedom co-MVP, Foley leaves with a 52-11-14 record, a 1.49 goals-against average, 19 shutouts, and a 13-1 postseason record. A University of Connecticut commit, Gendron was named Eberhart MVP and an All-League selection after scoring 6 goals and adding 14 assists this season. The senior defenseman finished with 76 career points (28 goals, 48 assists). He also plays baseball for Rivers. The Bay State Carey MVP was a stalwart on the Wamps’ back line, leading the program to its first Super 8 berth, sectional title, and Division 1 state final appearance. The three-sport athlete will do a post-grad year at Phillips Academy. With 11 goals and 26 assists, Hayes spearheaded a dynamic top line that helped carry the Raiders back to the Super 8 tournament. The Merrimack Valley/Dual County Division 1 MVP and three-time All-Star hopes to play a year of juniors before playing Division 1 hockey in New England. For the first time since 2003, the Eagles claimed both the Catholic Conference title and the Super 8’s top seed. The junior from Bridgewater helped guide the Eagles to the Super 8 semifinals with a team-leading 41 points (14 goals, 27 assists). The senior from Hanover netted 16 goals and 37 assists as the Hawks returned to the Super 8 for the first time since 2010. The leading scorer in the Catholic Conference during the regular season, Marini will play hockey at St. Anselm. The Merrimack Valley/Dual County Division 3 MVP served as the offensive catalyst to Wayland’s run to the Eastern Mass. final. A two-time North Sectional champion and three-sport athlete, the junior finished atop the league with 43 points (27 goals, 16 assists). A two-time Middlesex Liberty MVP, Redler wrapped up a stellar Sachem career with 19 goals and 30 assists as Winchester reached the Division 1 North quarterfinals. A four-year member of the varsity club, Redler tallied 126 points in 70 career games. He is undecided on college. The newest member of Marshfield’s 100-point club, Shea helped the Rams to a 15-8-0 record and the program’s fourth consecutive Atlantic Coast title behind a 19-goal, 35-assist junior season. The two-time league all-star finished second in scoring in Division 1. MC’s fourth consecutive Super 8 title was a memorable one for the senior from North Andover. A four-year varsity athlete, the UMass-Lowell-bound Sifferlen notched seven goals in Super 8 play as he eclipsed the 50-point plateau in his final season. The senior led the Middlesex Liberty champions with 20 goals, but his most important tally never made the stat sheet. Thomson’s 11th-round shootout goal in the Division 1 North final against Wilmington won the Rockets their first sectional crown in 26 years. A junior at the Dedham school, Wood earned MVP honors after a season in which he finished with 54 points in 29 games. The left wing and Boston College commit credits his coaches and teammates for this honor. He also plays golf for Nobles. The Middlesex Liberty champions took down four of the top five seeds in the North Sectional before skating past the South’s top seed in Braintree for the Division 1 crown. Doherty is in his fifth season as head coach and is 70-34-17 overall. Three seasons, three Super 8 titles for McLean and company since taking the reins from the late Chris Serino. This season, McLean and his staff guided the Lancers to their second 20-win season under his tutelage, bumping his overall record as head coach to 56-11-7. Gilligan led his Panthers to their second-consecutive 18-1-1 regular season and the top seed in Division 2 North. Beverly then outscored its opponents 18-4 in the postseason as the Panthers captured the program’s first state hockey title. Hayes’s second full season was one to remember. Watertown rode a 14-game unbeaten streak to the top of the Middlesex Freedom standings, giving the Raiders their first league title since 1985. The Marauders advanced to the Division 3 North semifinals. Atlantic Coast — Dennis-Yarmouth: Sean Donahue, Adam McClay. Falmouth: Jake Beaton, Robbie Souza. Marshfield: Chris Antoine, Sam Bartlett, JoJo Carbone, David Cataldo, Liam Manning, James Regan, Pat Shea. Nauset: Dylan Keasleau, Cam McPartland. Plymouth North: Mike Alberghini, Anthony Christensen, Justin Freyermuth. Plymouth South: Timmy Elrick, Dylan Finlay, Jordan Geiger, Drew Guadagno, Brendan Harty, Ryan Harty, Dylan O’Connel, Shawn Peckham. Sandwich: Alex Cabana, John Cassista, Spencer Cleary, Bryon Hopkins, Max Kent, Matt Landry, Marc Petersen. Bay State — Braintree: James Flaherty, Joe Harrington, Kyle Leslie, Nick Ward. Brookline: Jake Paul. Framingham: Cory Gorovitz, Al Lynch, Cullen Smith. Milton: Brian Nee, Connor Richard, Connor Shea. Needham: Danny Jacobs. Newton North: Anthony Calabro. Norwood: Jack Sheehan. Walpole: Patrick Baker, Bill Moore. Wellesley: Jack Maxwell. Weymouth: Pat Coleman. Big Three — Brockton: Justin Allen, Dan Heffernan, Ryan Hoff, Korey Paull, Ian Peterson, Alex Radcliffe. Durfee: J.P. Bonanca, David Piela, Jordan Raposo. New Bedford: Nick Bergantim, Justin Ferreira, Quinn Indio. Boston City — East Boston: John Lockhead, Kenneth Lockhead. Latin Academy: Thomas Guarino, Mark Guerard, Mike Mannion. O’Bryant: Daquane Blevins, Sean Haugh. Cape Ann — Amesbury: Austin Toohey. Lynnfield: Joe Bassi. Masconomet: Tyler Costello, Joseph Griffin. Newburyport: Matthew Kelleher, Ben Mirageas, Travis Wile. North Reading: Thomas Day, Keith Linnane, Jared Potter. Saugus: Steve Kay. Triton: Kyle Hillick. Catholic Central — Archbishop Williams: Mike Davis, Ryan Dunn, Nick Menzel, Ed Riley, Michael Sorenti. Arlington Catholic: Jon-Luke Dee, Brian Goggin, John Richard, Ryan Smith, Ryan Spagnoli, Ryan Tierney. Austin Prep: Robert Carpenter, Andrew Cross, JJ Layton, Brendan Leach, Ryan McDonough, Jake McKenelley, Cameron Russo. Bishop Fenwick: Nick Finan. Lowell Catholic: Jake Barnacle, Jesse Caisse, Rick Cincotta, Aaron Crandall, Michael Guay, Will O’Neil, Dylan Poirier, Griffin Rega, Matt Restuccia, Shane Silvia. Marian: Zaven Bablouzian, Ben Hansberry, Zach Moore, Alex Piselli, Nick Piselli, Brendan Walsh, Paul Walter. Matignon: John Andrews, Ben Parker, Brian Raimo. St. Bernard’s: Zach Bingham, John Lelli, Nick Nelson, Liam O’Brien, Alec Van Wagoner. St. Joseph’s Prep: Alexi Afanasier, Taras Kornelyuk, Denus Pylpenko, Pat Sullivan, Alex Watson. St. Mary’s: Jackson Allard, Bailey MacBurnie, Shawn MacBurnie, Jordan Manthorne, Dante Maribito, Max McKay, Chris Price. Catholic Conference — BC High: Trevor Davis, Steve DeForge, Patrick Kramer, Chris LaLiberte, Tim Larocque, Jake Lemanski, Ryan Shea, Sam Topham. Catholic Memorial: Aaron Clancy, Brandon Collett, Paul Hardiman, Anthony Pannagio, Michael Stathopolous, Zach Sullivan. Malden Catholic: Matthew Filipe, Will Lawrence, John McLean, Ara Nazarian, Alex Reissis, Nick Rolli, Tyler Sifferlen, Jake Witkowski, Pat Wrenn. St. John’s Prep: Jimmy Currier, Mark Etherington. Xaverian: Jon Beniers, Antonio Marini, Aidan Murphy, Tim Sweeney, Ryan Walsh. Catholic West — Cathedral (Springfield): Peter Crinella. Commonwealth — Mystic Valley: Brandon Kelso. Nashoba Valley Tech: Carl Marzolini. Northeast: Anthony Aresco, Shawn Curry. Rockport: Kyle Nelson. Shawsheen: Brandon Gentile, Alex Mosca. Eastern Athletic — Bishop Feehan: Joseph Geraghty, Kyle MacEachern. Coyle & Cassidy: Derek Boucher, Cam Dorsey, William Jacques, Kyle Lane, William Pacheco. Martha’s Vineyard: Tyson Araujo, Andrew Carroll, Brian Fraser, Alexander Vukota, Andrew Wiley. Somerset Berkley: Zach Raposa. Greater Boston — Cambridge: Dominic Freddura. Everett: Stephen Faia. Medford: A.J. Ansaldi, Brendan Hussey, Ross Watson, Brian Whooley. Somerville: Cam Alves. Hockomock — Attleboro: Andrew Campion, Zachary Larkin, Travis Tanguay. Canton: Tony Francescon, Andrew Howlett, Matt Lazaro, Ben Lodge. Foxborough: Kyle Sperzel. Franklin: Troy Donahue, Kyle Powers, Ryan Spillane. King Philip: Derek Abramson. Mansfield: Adam Blackman, Will Kelleher. Milford: Jared Balzarini, Brad White. North Attleborough: Marshall Blackman, Sean Young. Oliver Ames: Jimmy Tierney. Stoughton: Paul Sheehan. Taunton: Nick Terry. ISL — Belmont Hill: Will Golonka, Tyler Granara, Ryan McConnell, Matt Melanson. Brooks: Connor Moore, Ian Speliotis. BB&N: Brien Diffley, Connor Hegarty. Governor’s Academy: Zach Mirageas, Nick Nonis. Groton: Mike Brown, Ace Cowans, Matt Pompa. Lawrence Academy: Brendan Flanagan, Brendan Joyce. Middlesex: Justin Ferreira, Mike Menter, Eric Shaw. Nobles: J.C. Brassard, Cal Burke, Billy Sweezey, Cody Tedesco, Miles Wood. Rivers: Miles Gendron, Matt Lombardozzi, Hank Miller, Joe Sacco, Steve Vansiclen. Roxbury Latin: Jonathan Marchett, Robert Shaw. St. George’s: Hunter Johnson. St. Mark’s: Peter Housakos, Adam Lee, Luke O’Brien, Zach Tsekos. St. Paul’s: Luke Babcock, Nathan Colannino, Cam McCusker, Connor Sodergren, David Storto. St. Sebastian’s: Will D’Orsi, Matt Doherty, Corey Ronan. Thayer: Jon Barry, Steve Cochrane, Adam Gaudette, Lincoln Griffin. Mayflower — Blue Hills: Nick Edwards, Mark Travers. Diman: Mike Lavoie, Jason Silva, Josh Sullivan. Nantucket: Ryan Holdgate. South Shore Voc-Tech: Chris Grazioso. Southeastern: Matt Niklason. Tri-County: David Cawley. Merrimack Valley/Dual County — Acton-Boxborough: Ben Barton, Brian Reilly. Bedford: Brendan Flynn, Matt Judge. Billerica: Ed Stokes. Boston Latin: Connor Moccia. Central Catholic: Lloyd Hayes, Alex Lester, Colin Soucy, Corey Webber. Concord-Carlisle: John Carroll. Dracut: Payne Bourgeois. Haverhill: Tom Maguire. Lincoln-Sudbury: Ryan Dale, Matthew Jacobs. Lowell: Brent Sullivan. Methuen: Dylan Yameen. Newton South: Thomas Tresca. Tewksbury: Ross Budryk, Jack Cash, Kyle Paquette, Ryan Petti. Wayland: Lucas Bastarache, Marcus Daisy, Nick Morgan, Peter Orlandella. Westford: Cam MacDonald. Middlesex — Arlington: Seth Coiley, Jack Kelly, Justin Nee. Belmont: Nick Vetrano. Burlington: Adam Crowley, Joey Scali. Melrose: Jon Bothelo, Eric Mercer. Reading: Jake Barbera, Mike Seibold, Michael Thomson. Stoneham: John Gallagher. Wakefield: Sam Carr. Watertown: Anthony Busconi, Trace Dodge, Dante Flori. Wilmington: Drew Foley, Cody McGowan. Winchester: Brendan Greene, Nolan Redler, David Troiano. Woburn: Jeremy Flibotte. Northeastern — Beverly: Nick Albano, Tim Birarelli, Connor Irving. Lynn Classical: Ryan MacDonald. Marblehead: Liam Gillis, Thomas Koopman. Winthrop: Chris Page. Old Colony — Barnstable: Donnie Brodd, Chris Fowler, Kevin Huska, Mike McDonough, Cody Pasic, Kyle Rood. Bridgewater-Raynham: Christian Cellini, Justin Daniels, Nick Holmes, Connor Sullivan. Dartmouth: Jack Arruda, Joseph Correia, Ryan Gaydou, Brendan Sullivan. Patriot — Duxbury: Matt Murphy, Trevor O’Brien, Tyler Powers, Matt Saia. Hanover: Drew Caldwell, Matt McDougall, Pat Nevins. North Quincy: Nolan Greene. Quincy: Pat Donovan, Pat Freeman, Brian O’Callaghan. Scituate: Josh Beck. Silver Lake: Ryne McNeilly. South Coast — Bourne: Jim Commesso, Ed Lavelle. Dighton-Rehoboth: Nick Soars. Greater New Bedford: Adam Carvalho, Matthew Costa, Benn Jenkins. Old Rochester: Jeremy Lawton, Chris Nadeau. Wareham: Stephen Toal. South Shore — Abington: Chris Fay, Joe Marella, Jake Quinlan. Carver: Craig Lauzon Sacred Heart: , Adam Pagliuca, Mark Simonetti. Cohasset: Terence Doonan, Matt Legge, Colin Whelan. East Bridgewater: Cam Troup. Middleborough: Cody Braga, Alex Dandreta, Jeremiah Sylvia. Mashpee: Eric Garrison. Norwell: James Daly, Alex Ferguson, Cam Labadie, David Seoane, Matt Smith, Dave Talanian. Rockland: Tim Daggett, Shawn Kane, Andy Reardon, Colin Sheehan, Trevor Trudeau. Tri-Valley — Ashland: Derek Masionis, Tyler Perry, Spencer Wilson. Dover-Sherborn: Sam Schroeder. Holliston: Brad Arvantis. Hopkinton: Cam Finlayson. Medfield: Matthew Crowell, Pat Lawler, Matt Trieber, Rob Trieber. Medway: Mark Bittrolff, Andrew Karlin, Kevin Kaufman, Josh O’Toole. Westwood: Ken Mackin, Will Ribas. Correction: Because of a reporting error, Joey Scali’s name was misspelled in an earlier version of this article.